UFC 126 appears to be one of the stronger cards of 2011, a year that’s shaping up to be one of the best in UFC history. UFC 125 started the year with the grueling Edgar/Maynard fight for the Lightweight Title and this stacked card looks to keep the ball rolling for Dana White and company. The Middleweight Title will be at stake, while there are two big light heavyweight fights with title implications. Miguel Torres, Demetrious Johnson, Donald Cerrone, and Norifumi “Kid” Yamamoto will all be making their UFC debuts in what’s shaping up to be an amazing pay-per-view event. UFC 126 will be live on pay-per-view tonight at 10:00 PM EST/9:00 PM CST, with preliminary fights on Spike TV at 9:00 PM EST/8:00 PM CST. The Demetrious Johnson and and “Kid” Yamamoto fight will also be live on Facebook at 8:00 PM EST/7:00 PM CST. Middleweight Champion Anderson Silva will be back in action for the first time since his thrilling submission victory over Chael Sonnen. Silva will attempt to successfully defend his Middleweight Title for an amazing eighth time since winning the title from Rich Franklin in 2006. Vitor Belfort, meanwhile, last fought nearly 18 months ago. He also defeated Rich Franklin in what served as his return to the UFC. Belfort is on a five fight winning streak with modest wins over Matt Lindland and Terry Martin. It feels like Vitor Belfort, though only 33 years old, has been around forever. He was one of the earliest stars the UFC produced and understandably so. He was a young, good looking Brazilian kid with lightning fast hands. That was many years ago and this is now Belfort’s third stint with the company. Skill has never been the problem with Vitor, as he’s a world class grappler and a great boxer. Rather, Vitor has always had difficulty with his focus. Ben Fowlkes at Sports Illustrated wrote a really good piece about some of the concerns with Belfort’s makeup. It’s also not a good sign that Belfort fired his striking coach mere weeks before this fight. Vitor has the talent, but will he be able to overcome any mental deficiencies en route to claiming the Middleweight Title? Anderson Silva, meanwhile, looked unstoppable for the longest time. Dominating wins over Franklin, Forrest Griffin, Demian Maia, and Dan Henderson have punctuated Silva’s title reign. He faced real peril in his last fight with Chael Sonnen, but Silva found a way to submit the wrestler after being dominated for four rounds. Sonnen’s wrestling is top notch and it exposed some potential weaknesses of “The Spider”, but is this indicative of more? Silva is a supremely talented fighter, showing he can win fights with his striking and his grappling, but some speculate that age has caught up to Silva. The Sonnen fight has caused a lot of fight fans to question the current state of Anderon Silva, since he was thoroughly dominated for the majority of a five round fight. Silva’s been a dominant champion for such a long time, but has time caught up to this MMA legend? I feel like if Anderson Silva’s skills are deteriorating, it won’t show against Vitor Belfort. Vitor is supremely talented, but fighting someone like Silva is a very intimidating endeavor. Aside from his fight with Rich Franklin, Belfort hasn’t defeated a top fighter in more than seven years. Belfort is only 7-5 since losing his UFC Light Heavyweight Title to Randy Couture in 2004. In that same time period, Anderson Silva has gone 16-2 against a much better class of competition. At this point in time, I feel safe in saying that Silva is a superior fighter to Belfort both physically and mentally. An 18 month layoff isn’t helping matters for “The Phenom”. 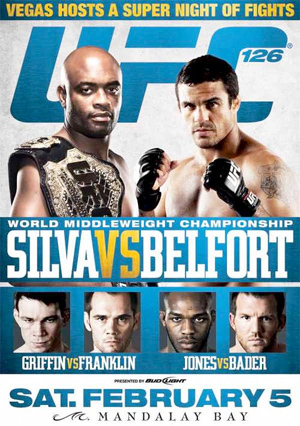 The UFC is touting Belfort as a challenge for Silva, but I have a feeling this will be a very one-sided fight. What looks like the most exciting fight of the night should advance a fighter in to the light heavyweight title picture. Undefeated Ryan Bader has looked extremely impressive during his 5-0 run in the UFC. The Ultimate Fighter Season 8 champion has big wins over Keith Jardine and Antonio Rogerio Nogueira, amongst others, and has been steadily climbing the ladder in the UFC light heavyweight division. A lot of the same could be said about Jon Jones, whose only loss was a questionable disqualification against Matt Hamill. Jones has absolutely dominated Brandon Vera and Vladimir Matyushenko and faces a big step up in competition against Bader. Both fighters have strong wrestling backgrounds, though Bader is the more decorated wrestler. Bader has shown the ability to end fights with very good power. His striking is a bit wild, but Bader appears to be constantly approving his game. If we’re going to talk about wild striking, then we of course have to talk about Jon Jones. With an 84.5 inch reach, Jones has proven to be the most dynamic striker in the UFC. Jones’ TKO win over Brandon Vera showed how scary he can be, breaking Vera’s orbital bone with an elbow from his opponent’s guard. Jones throws dangerous strikes that come from out of nowhere, but he hasn’t been afraid to look for takedowns. Jones has shown continuous gains while working out of Greg Jackson’s camp and Bader will be his biggest challenge to date. Most pundits seem to be picking Jon Jones – his hype is massive at this point. Though he’s been the flashiest of these two fighters, I’m not convinced that he’s been the best. I like Ryan Bader’s victories more than I like Jones’, and the Hamill fight showed that Jones’ style can potentially be a detriment. Jones’ reach will also be an advantage and he might be able to catch Bader if he starts throwing wildly. I’m curious to see what might happen if Bader puts Jones on his back for an extended period of time. Bader should be able to control Jones if this turns into a grappling match, but I’m not sure that I see the fight going that way. I feel like Ryan Bader has a very good chance to win this fight. He’ll have to keep Jones off guard with his takedowns and power, though that will be easier said than done. Bader has to be patient and try not to be hasty in engaging Jones. I really feel like this is Bader’s fight to lose. Jones is flashier and has all of the hype, but I think Bader is a stronger wrestler and will have an easier time controlling the fight. Getting past Jones’ unorthodox offense is no easy task, but I think Bader is up to the challenge. This is another fun and relevant light heavyweight contest. Though Forrest Griffin and Rich Franklin represent a slightly different generation of MMA fighters than the aforementioned Jones and Bader, the winner of this fight has to be considered a top light heavyweight contender. Griffin has been out of action since defeating Tito Ortiz in November 2009. Franklin rebounded from his loss to Vitor Belfort with a devastating knockout victory over Chuck Liddell in June 2010. Griffin and Franklin are similar fighters so this might be a hard fight to call. Both have Brazilian jiu-jitsu experience, but I doubt we’ll see much of that in action. This fight will more than likely stay on the feet which plays into the hands of Rich Franklin. Forrest hasn’t won a fight via KO or TKO since beating Elvis Sinosic in 2005. That doesn’t seem to persuade the fan friendly Griffin from trying to stand and throw with his opponents. Franklin has traditionally had more luck with striking, so I think this fight is very much to his advantage. A lot of people like to talk about Rich Franklin losing a step, but I feel like Forrest is a bit further behind at this point in his career. Going more than a year without fighting is really to Forrest’s detriment, especially since he hasn’t had a quality win since beating “Rampage” Jackson for the Light Heavyweight Title in June 2008. Forrest was dealt a crushing loss by Anderson Silva, doing a great deal of damage to his reputation. As a side note, while the fighters from the first season of the Ultimate Fighter are very popular, they haven’t been much more than average or above average fighters. Forrest, Stephan Bonner, Josh Koscheck, Kenny Florian, and Diego Sanchez have all made names for themselves, but I don’t feel like any of those fighters have taken the steps to become elite talent. Those fighters will always get shots since they’re a beloved group (save for maybe Josh Koscheck), but I think the TUF Season 1 fighters are fairly overrated as a whole. Back to the fight at hand, I feel fairly confident in the outcome. I don’t know that Forrest will have what it takes to beat Rich Franklin. Franklin has been amongst the toughest and most resilient fighters in the UFC and I don’t see any way that Forrest finishes him. Franklin’s stand-up is crisper than Forrest’s, and frankly, I think he possesses a mental toughness that Forrest lacks. Forrest might be able to take a Leonard Garcia-like decision if he stay active enough, but I feel like Rich “Ace” Franklin is in position to win this fight and move closer to Light Heavyweight Title contention. Ellenberger vs. Rocha makes for an interesting fight, though I have the feeling we might see an upset here. Ellenberger has had success in the octagon, defeating Mike Pyle and John Howard and pushing Carlos Condit to a very close split decision. Ellenberger has established himself as an up and coming welterweight and would gain a lot from a victory here. Rocha, meanwhile, impressed many with a quick submission victory over Kris McCray in his UFC debut. Rocha is an extremely impressive grappler, having won eight of his nine fights by submission. His BJJ is outstanding, which might give Ellenberger some pause when attempting takedowns. Ellenberger is a very good wrestler, but he also has some knockout power. Though he might not be facing Jon Fitch (his originally scheduled opponent), Ellenberger still has a big challenge ahead of him in Carlos Rocha. Ellenberger is definitely capable of controlling this fight, but he has to be very careful of Rocha’s dangerous submission ability. The last time we say a fight like this, Waylon Lowe handled Willamy Freire fairly easily. The difference here is that Ellenberger isn’t nearly as powerful as Lowe and may not have as easy a time controlling Rocha. That said, Ellenberger has still done very well against some stiff competition in the UFC and Rocha is still fairly unproven. I think Ellenberger should be able to take a decision here, though I wouldn’t be surprised with a submission victory for Rocha. Two former WEC bantamweights will be making their UFC debuts at this event. Miguel Torres has long been the class of the bantamweight division, though losses to Brian Bowles and Joseph Benavidez derailed the Chicago native. Torres was able to finish his WEC career strong with a win over Charlie Valencia and he’ll look to keep this going upon his entry into the UFC. Banuelos has been one of the longest tenured fighers in the WEC and has won four of his last five. Miguel Torres is a very well rounded fighter with a BJJ black belt and solid striking. Torres is more likely to pull of a submission victory than a knockout victory, but he’s not afraid to throw with you. Banuelos is a strong wrestler with good boxing and he always manages to put on good fights. Torres and Banuelos should be able to put on a very exciting fight and could be an early candidate for Fight of the Night on a very stacked card. Torres is a world class bantamweight and is the odds on favorite in this fight, but it could be an extremely competitive bout. Two of Torres’ three losses have come to bantamweights currently ranked in the top three, which is fairly impressive. Torres will look to climb a bit further in the bantamweight division with a win over Banuelos, but a win for Torres isn’t a sure thing. The only featherweight bout of the night has important title implications. Michihiro Omigawa will be making his return to the UFC after having spent time in the promotion at lightweight. Omigawa has been one of the hottest fighters in the world since debuting at featherweight, going 8-2-1 since making the drop in weight. Omigawa has most recently been fighting for DREAM and Sengoku. Chad Mendes, meanwhile, has been tearing up the WEC’s featherweight division. Mendes went 4-0 in the WEC in 2010 with wins over Cub Swanson and Javier Vazquez. Chad Mendes is amongst the best wrestlers in MMA, previously taking second in the nation at 141 lbs. garnering All-American honors. Mendes controls fights and guts out decision wins, though he’s shown submission skills in the past. Mendes will look to rely on his stellar wrestling to control the entirety of this fight. Omigawa is a world class judo practitioner who has recently displayed some submission skills. Omigawa is a bit more well rounded than Mendes, though he is at a decided disadvantage when it comes to wrestling. Omigawa is still dangerous and can likely outstrike Mendes, which I would have to guess is Omigawa’s approach. That said, wrestling is still king in MMA. Good wrestlers are generally able to control fights, dominate opponents, and take clear decision victories. These aren’t the most exciting fights, but that doesn’t change hoe effective wrestling can be. Mendes is such a good wrestler that I have a hard time seeing Omigawa pulling out a win. Mendes will land numerous takedowns and control the fight, but it will be interesting to see if Mendes can stay active enough on top. This will still be a very close fight (closer than the odds suggest) and an Omigawa win wouldn’t stun me. But I see Omigawa struggling with Mendes’ wrestling for the bulk of this fight. WEC lightweight standout Donald Cerrone will be making his UFC debut tonight against UFC veteran Paul Kelly. Cerrone closed out his WEC career very strong with wins over Jamie Varner and Chris Horodecki. Kelly, meanwhile, has been pretty hot and cold in the UFC. He’s gone 5-3 since joining the UFC and is just 3-2 at lightweight. Kelly is coming off a win over T.J. O’Brien in November. “Cowboy” Cerrone is a very strong kickboxer and has great submission skills. He’s a very exciting fighter who is capable of ending fights in any number of ways. Kelly isn’t afraid to throw, though he can’t match the Muay Thai of Cerrone. He has a wrestling background, but again, is outmatched by Cerrone and his excellent submissions. I feel like Paul Kelly is completely outmatched in this fight. He’s a tough, veteran fighter, but Cerrone is better standing and on the ground. Kelly is a very tough guy and I have a hard time seeing him get knocked out. I also don’t think he’ll be very inclined to bring this fight to the ground, since Cerrone is a very dangerous submission artist. I look for Cerrone to take a fairly one-sided decision here, but there could be a lot of fireworks in this one. These two fighters will be making their UFC debuts tonight, Johnson having previous competed in the WEC and Yamamoto coming from Japan. Johnson has looked fairly impressive in the WEC, taking wins over Damagio Page and Nick Pace. After an 18 month break in action, “Kid” Yamamoto has struggled lately, going 1-2 since May 2009. Yamamoto only recently dropped down to bantamweight, winning his sole fight at 135 lbs. against Federico Lopez. Demetrious Johnson is a stand-out wrestler who has shown flashes of dominance during his time in the UFC. He can pull out a submission or two, but Johnson will spend most of his time trying to grind his opponents out. Yamamoto has a wrestling background, but is an extremely exciting striker. We’ve only seen flashes of that since Kid’s return to MMA in 2009, so it’s possible that age has taken its toll on the 33 year old Yamamoto. He flashed some of his old skills against Lopez in his last fight, but I’m anxious to see how Yamamoto fares against a young stud like Johnson. This fight shares some similarities to the Mendes/Omigawa match, though Yamamoto is a far more explosive striker than Omigawa. Both of these Japanese stars will have their hands full with great wrestlers and will struggle to get wins. Like Omigawa, I see Kid struggling with the superior wrestling of his opponent. Kid just hasn’t shown much recently to indicate that he could be competitive against a fighter like Demetrious Johnson, who should be able to get a decision win. Given the depth at lightweight, this has the feeling of an elimination match at lightweight. Paul Taylor has lost two straight in the octagon, though the Stout decision could have gone either way. Taylor is 3-5 in the UFC since debuting in 2007, and while he puts on entertaining fights, losing a third straight would seemingly doom the Brit. Gabe Ruediger, meanwhile, will be competing in just his second UFC fight. Honestly, Ruediger looked 100% outmatched in his loss to Joe Lauzon in August and needs to respond with a good showing. This will be a real styles clash as Taylor is an excellent kickboxer while Ruediger is a BJJ black belt. Prior to joining the UFC, Ruediger won five of six fights by submission, though he was easily submitted by Lauzon in his UFC debut. Taylor, meanwhile, doesn’t finish fights and generally doesn’t do a whole lot to definitely win a fight. He pushes a good pace and likes to excite the fans, but this hasn’t translated to UFC success. I think that Ruediger will hang around long enough to bring Taylor down and submit him. If Taylor wants to win this fight, he’ll have to knock Ruediger out and that’s something I don’t see happening. Kyle Kingsbury, another fighter from Season 8 of the Ultimate Fighter, has had a rocky road in the UFC thus far. After a loss to “Filthy” Tom Lawlor, Kingsbury has won two straight in the octagon, last defeating Jared Hamman. Romero made his UFC debut in July, submitting veteran Seth Petruzelli after absorbing significant punishment early in the fight. Romero has proven to be an excellent grappler, winning five of his last six fights by submission. AKA product Kingsbury has a wrestling background and has been improving his Muay Thai. I don’t think Kingsbury will want any part of Romero’s jiu-jitsu, but his striking won’t be enough to put Romero away. I expect Romero to pick up another submission in this fight. Mike Pierce has gone 3-1 in the UFC thus far, but hasn’t faced much by way of top flight competition. Jon Fitch was his toughest opponent and that showed as Pierce lost by unanimous decision. Kenny Robertson will be making his UFC debut after being successful in a single appearance for Bellator in August 2010, where he defeated Ultimate Fighter contestant John Kolosci. Both men have wrestling backgrounds and this fight could spend a lot of time on the ground. Robertson has confirmed that he wants to spend a lot of time grappling, while we could likely assume the same for Pierce. The only difference is that Pierce has had greater success against higher level competition than Robertson. Pierce should be able to score his third consecutive UFC win against Robertson.